Many of us regard this hardy perennial as a fruit, but rhubarb is an easy to grow vegetable, which can be eaten in savoury or delicious sweet dishes. The vegetable grows best in a sunny spot, in a fertile, well-drained soil, but dislikes wet conditions. It doesn’t grow well in sandy soils unless plenty of organic matter is added, and in clay soils some roughage material, such as grit, will be needed to improve drainage. 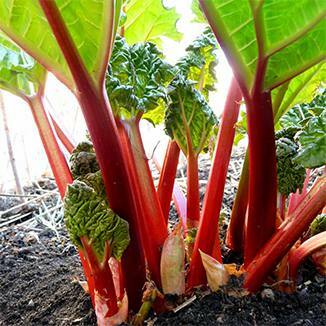 Rhubarb prefers a cool climate and will withstand cool winters – the main requirements are plenty of manure and water, so before planting blend compost and/or rotted manure to the soil. It can be grown two ways, either from seed or by dividing existing plants – division is the best and quickest option. Propagate or divide in late winter by splitting the crown with a sharp spade, and plant the divisions – choose strong, young pieces with healthy growth buds – about 1m apart with the buds just below soil level. After dividing allow the plant to establish by harvesting only sporadically until year two. Rhubarb takes two to three seasons to establish from seed, so leave seedlings undisturbed for the first year. Keep plants well watered during dry periods, and add a layer of compost or pea straw around plants to help retain soil moisture – those large, green leaves take a lot of water from the plant, and lack of water can cause spindly, weak stems. Apply a general fertiliser once a year, in spring. Rhubarb can be forced into growing stalks earlier in the season. If the ground hasn’t warmed up sufficiently for plants to really get growing, cover them with a thick layer of straw – they’ll begin growing earlier, and you can harvest days or weeks before you normally would. Pull stems (the leaf blades and roots are poisonous) when the plants are growing strongly, and always remove flower heads. Although thick stalks are delicately flavoured, the larger stalks can sometimes taste bitter and become woody. When harvesting, grasp a stalk firmly close to the ground. Twist and pull the stalk and it should break free from the plant – do this carefully so you don’t break off any new shoots. If you can’t twist stems easily, cut off as close as to the base of the plant as possible. 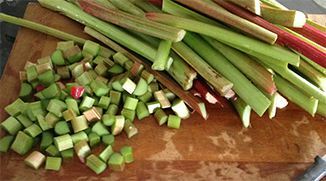 Always compost the poisonous leaves or discard – don’t feed to your animals or chickens (the old, traditional method of burying rhubarb leaves before planting members of the brassica family is thought to control club root – the oxalic acid in rhubarb stems helps inhibit the enzymes that cause club root). 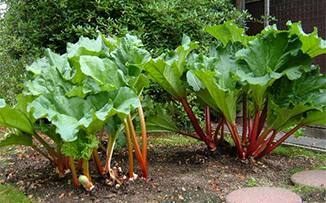 There are two varieties of rhubarb – evergreen and winter dormant. Winter dormant types, such as ‘Victoria,’ die down each winter and reappear when the soil warms in spring. ‘Victoria’ has healthy, strong, upright growth, and the high yielding plants have broad, thick, green-shaded red stalks with a pleasant flavour. ‘Glaskins Perpetual’ is an excellent evergreen variety, early-maturing with long and slender, juicy, bright red stalks.